Total Guest Numbers – Simply the number of guests coming to your day and evening reception along with the number of children (and their ages). Food Choices – If you have opted for a menu that gives your guests a choice of food options, then a breakdown of how many guests would like each choice is required e.g. 53 beef including 3 children (aged 5, 7 and 9), 35 chicken and 5 vegetarian. 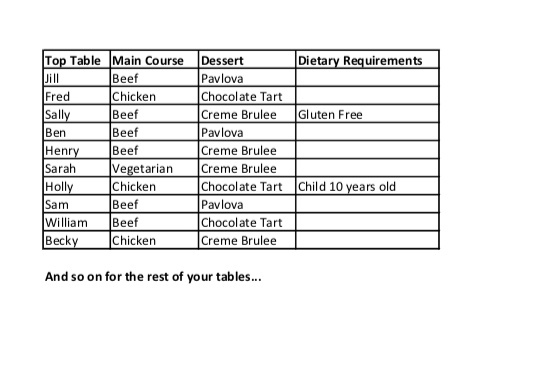 If your menu includes any sharing courses, these will simply require a list of any dietary requirements. Dietary Requirements – If any of your guests have raised any special dietary requirements, then please let us know and what food choices they would like. We will always make sure that every guest is catered for but this does require some planning on our behalf so it is important that we have time to do this. The weeks before your wedding day can be really fun; get creative and have a few nights in with your friends making decorations for your venue. 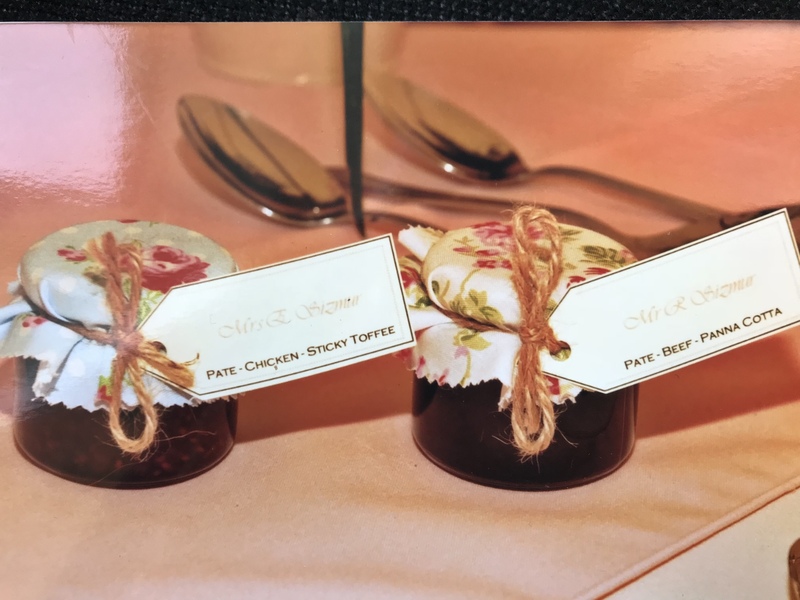 Making your own place cards can be a great way of saving money and allows you to tailor them towards your theme. If your menu gives your guests a choice of food options, please spend a bit of time writing each guest’s choices on the back of your place card. This enables wedding caterers to serve your guests efficiently and professionally without interrupting their conversations. Little images of a chicken, cow and carrot to depict their food choices, for example, can provide a fun alternative way of doing this. Five to three weeks before the day, get those last few details crossed off your list. Rope in one of your bridesmaids or groomsmen to give you a hand buying your drinks for your reception and wedding breakfast. This will save you worrying about it in the days before your wedding, or the supermarket not having enough of your favourite wine. Not sure how much Prosecco you’ll need for speeches? Ask us, we’re here to help, and can give guidance on estimated quantities. When you have a spare hour, its also a good idea to have a think about what you would like your team of helpers to do on the day before your wedding. Having twenty people keen to help can sound amazing but be careful! Too many people can cause confusion and add to your stress rather than reduce it. Choose people who you know are organised and are happy to just get on with what you have asked. If you know, you struggle to delegate then make a list of who you would like to do what, which everyone can refer to throughout the day. There really is no need to be up into the early hours of your wedding day getting ready. Use your friends and family effectively so you can spend the evening relaxing or go down to the local pub for a meal. If the temperatures are climbing, your wedding guests are likely to be very thirsty by the time they arrive at your venue. So make sure if your water supply is in bottles that you buy some extra in the days prior. Ensure that you have plenty of soft drink available. Even if most of your guests drink alcohol, many will want a soft drink when they arrive to quench their thirst, before moving on to the alcoholic options. If the Great British weather is looking like it might not play ball, it is important to have a wet weather plan in place… just in case. If your wedding is in a marquee, its worthwhile enlisting a few willing volunteers to put out any cardboard menus or place cards etc. on the morning of your wedding. If the air is damp, the corners can start to curl and topple over. Think about areas that will receive high traffic, whether that be from lots of feet or vehicles. These areas can get pretty muddy, very quickly. Grabbing a few bags of bark chip from your local store, to spread in these areas can make the experience much more enjoyable and save your beautiful outfits from becoming a patchwork of mud stains. Where will arrival drinks be served if its raining? 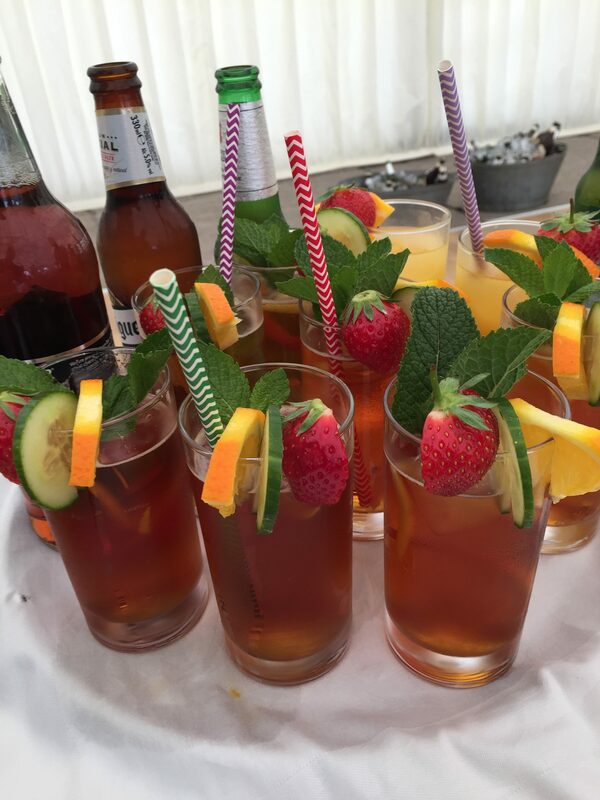 Have an area of your marquee that can be used for arrival drinks if the sun doesn’t make an appearance. Find a friendly farmer with a tractor! 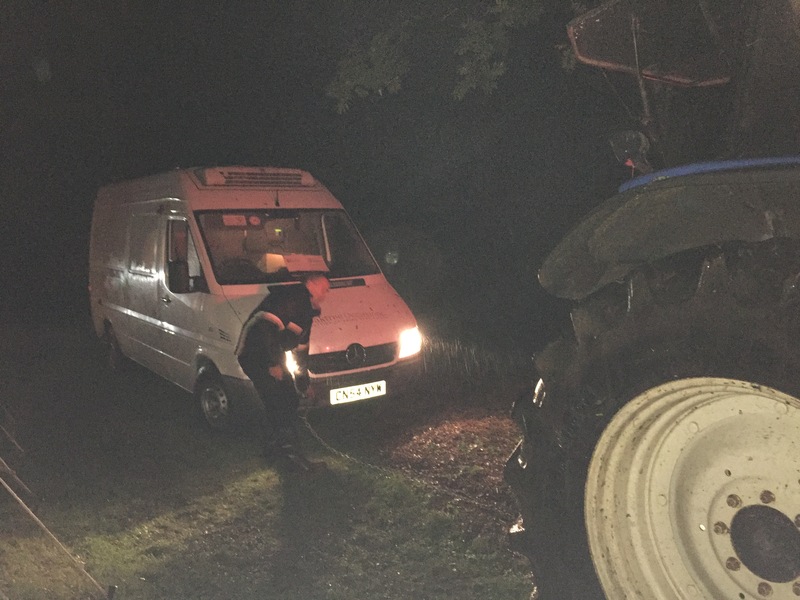 The last thing you want to be worrying about at 1 am is your guests or suppliers getting stuck on their way home. Ask a local farmer with a tractor if they would mind being on standby to tow people out, this will leave you to relax and have fun. Lastly, enjoy it!! The most important thing to remember right from the start of your wedding planning process is that your suppliers, from caterers to photographers, want to help you. They are all highly experienced in their area and can offer you fantastic advice, hints and tips that will allow you to enjoy your day. Your suppliers are there to relieve any stress, not add to it so spending time from the beginning finding the knowledgeable suppliers is vital. Dates are filling up fast for 2019, if you would like to book us for your wedding, corporate event or function please do get in touch.